The Moonwalker is One of the Top Producing Fishing Charter Boats in Quepos. The Moonwalker, our custom 33-foot Dawson is the ideal platform for big game fishing in the calm seas off Quepos. Whether we're live-baiting for marlin and sailfish, or tight against the rocks searching for monster roosterfish, you'll fish in complete comfort all day long. The Moonwalker was renovated and upgraded in the fall of 2013. The topside and bottom side of the boat have been completely repainted and a fully-redesigned tuna-tube bait station installed on the transom. New upholstery has been installed throughout and electronics updated. In addition, the Cummins QSL9 Turbo Diesel has been completely rebuilt and is producing quiet, dependable power to speed you to the fishing grounds at 24 knots. 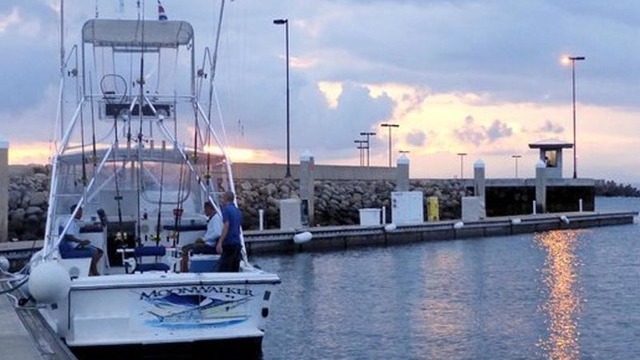 With the Moonwalker back in the water at Marina Pez Vela, the billfish don't stand a chance!